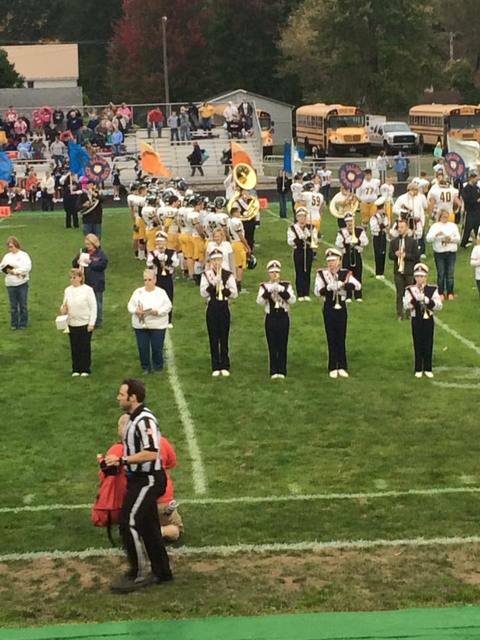 An incident between the Galion Marching Band and the River Valley football team before Friday night’s Homecoming game at Unckrich Stadium has left band members with a sour note. As the band, filled with high school students and alumni, marched across the field during pre-game festivities, the River Valley team didn’t move out of the way, which led to an odd scene of the Galion band marching and playing around the team as it did its warmups. According to several Galion officials, the field was supposed to be cleared at 6:30 p.m. for the band, but the River Valley team remained on the field. River Valley Athletic Director Barry Dutt said the team was told about the ceremony before Friday, but weren’t made aware of where to go Friday night. River Valley High School principal David J. Coleman agreed with Dutt, saying communication could have been better. During the incident, it appeared that there was some contact between players and band members, but no serious injuries were reported. Crystal Payton, who has two children in the band, says she saw one member with a bloody lip and members were being sworn at by River Valley football players. In addition, when the color guard marched from the north end to the south end of the field, it appeared that the River Valley players didn’t give much space for them. Also, players reportedly didn’t leave the field until after the national anthem started and some walked to the locker room during the song. Kaitlin Stakey, who serves as the Assistant Band Director at River Valley, took to Twitter following the game to express her displeasure with the football team. She followed up by saying River Valley band members were trying to move the team. “Our band was screaming at them to move and the parents were staring at us like we were doing something wrong,” she added, citing in a later tweet about how multiple players ran over a River Valley player during last week’s pregame. Civitas Media reporter Andrew E. Carter contributed to this story.